It was a tale of the new trumps the old on the first day at Phillip Island in the FIM Superbike World Championship first qualifying sessions. The new qualifying system saw today’s two one hour long sessions determine the shape of Superpole One and Two, to be held after a short warm-up session on Saturday. Race one will now be on Saturday afternoon, with race two on Sunday through 2016. The new combo of Sylvain Guintoli and the all-new WorldSBK spec cross plane crank Yamaha YZF-R1 were fastest of all today with a 1’30.865 - comparing well with his record 1’30.038 best lap set in 2014 on an Aprilia. 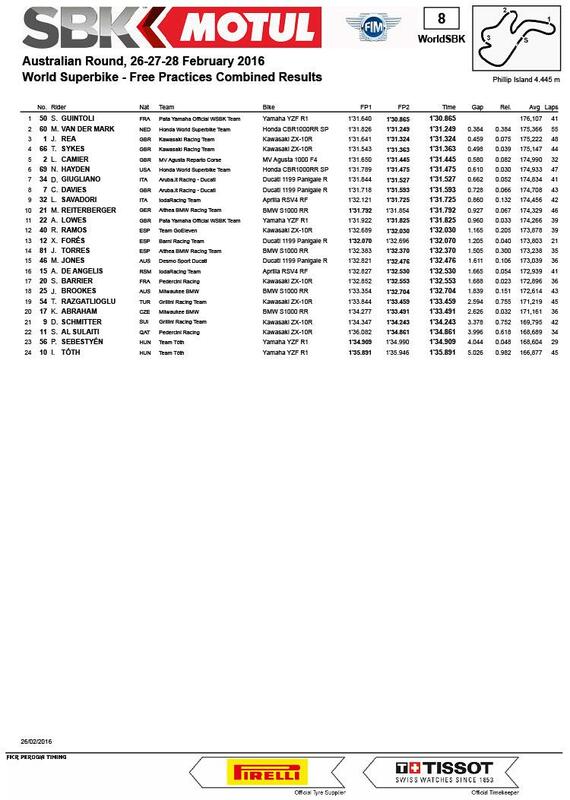 A strong start to the year from the year-old pairing of Michael van der Mark and his Honda World Superbike team machine saw him second fastest today, even if he was a step of 0.384 seconds down from the fast and flowing Frenchman and his awesome new bike. Otherwise, qualifying was very close behind the top rider. Kawasaki’s all-new Ninja ZX-10R four-cylinder powered Jonathan Rea and Tom Sykes to third and fourth places respectively, showing their all-new low inertia crank bike also has pace early in the year. Leon Camier (MV Agusta Reparto Corse) proved his good early start in the first session this morning was no fluke, as he scored fifth overall and enters Superpole 2 directly. New WSBK star, and former MotoGP Champion, Nicky Hayden secured a sixth place going into Saturday’s Superpole session on his Honda WorldSBK machine. Davide Giugliano (Aruba.it Racing – Ducati WSBK) placed seventh and his team-mate Chaz Davies eighth, making them the top Panigale riders on day one of the new year. The sensational Lorenzo Savadori put himself and his Ioda Racing Team Aprilia ninth into Superpole, a great start for a very last minute team, albeit on last year’s official Aprilia vee fours. The Friday top ten was rounded out by top BMW rider, Markus Reiterberger (Althea Racing BMW), the last rider to enter Superpole 2 directly. He was less than a second behind Guintoli, and top BMW man on the day. 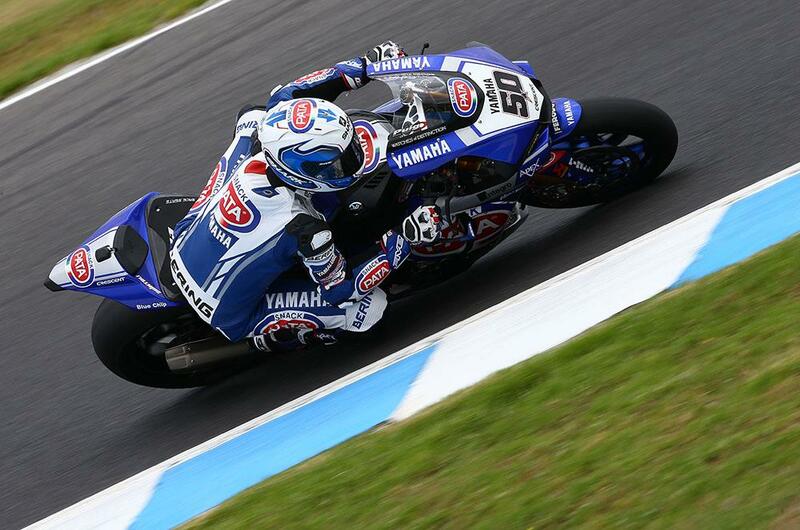 Alex Lowes (Pata Yamaha) was 11th, privateer Roman Ramos (Go Eleven Kawasaki) 12th. Aussie Mike Jones Desmo Sport Ducati) climbed into the top 15, and the still recovering Alex De Angelis (Ioda Racing Aprilia) a battling 16th.